Take The Floor: Interview: Nikki - Take The Floor's teacher for the Yorkshire area gives us her top tips for wedding dances. Interview: Nikki - Take The Floor's teacher for the Yorkshire area gives us her top tips for wedding dances. 1) Pick a good song – Ideally choose a song that means something to you both but that also has a good, regular beat so that you can easily dance to it. 2) Start your wedding dance lessons early but not too early – It’s good to have your last wedding dance lesson about 2 - 3 weeks before your wedding. That way it's near enough to remember it well but far enough away so that an extra session or half session can be squeezed in if necessary. 3) Practice, Practice, Practice - is very important between your wedding dance lessons to help you feel relaxed and comfortable on your big day. It doesn’t have to be formal practice – just a quick run through while the kettle’s boiling, or just practising the parts of the dance you find trickier. 4) Create lasting memories – Ask your wedding dance teacher for some moves that will make memorable photos – perhaps some lifts, dips turns, anything that makes you both look amazing for that special photo for your mantelpiece! 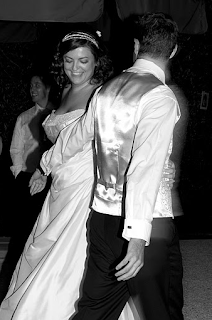 5) Have fun – often find that wedding dance lessons can be a relief from the other stresses of wedding planning and are surprised how much they enjoy them. Wedding dance lessons give you time together as a couple but also help you to enjoy your big day so much more and give you the confidence to go out and wow your wedding guests.